Find everything you need to build your dream dollhouse with Superior Dollhouse Miniatures. High quality and affordable, our selection of Miniature Cookware & Dishes, dollhouse miniature furniture, building supplies, accessories, dollhouses, and miniature decor will provide detailed charm to any remodel or new construction! 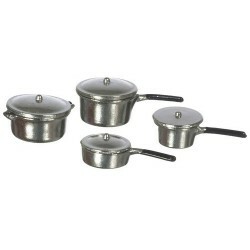 Redecorate and redesign your dollhouse with this Pot & Pan Set Satin Bronze 10pc. Your decor and collection of miniatures will be taken to another level of fabulosity. 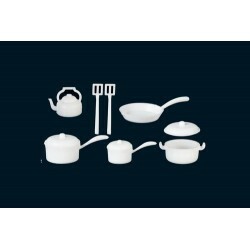 You will love this Pot & Pan Set White 10pcs as it complements your other miniature dollhouse furnishings. Now is the time to design a great new look! 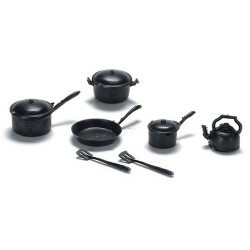 Adding this Black Kitchenware/10 Pc to your miniature collection is just what you need to make your dollhouse a home, and showcase your fabulous taste. 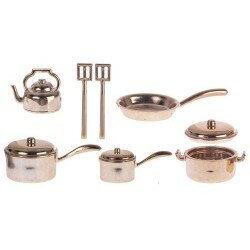 You will love this Pot & Pan Set/10 Pc as it complements your other miniature dollhouse furnishings. Now is the time to design a great new look! 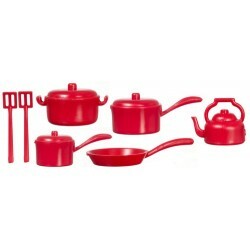 Adding this Red Kitchenware/10pcs to your miniature collection is just what you need to make your dollhouse a home, and showcase your fabulous taste. 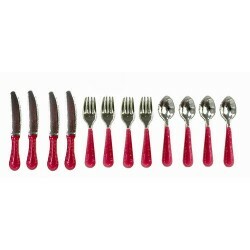 You will love this Red Silverware 12pc as it complements your other miniature dollhouse furnishings. Now is the time to design a great new look! 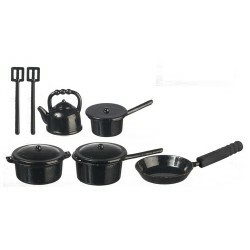 Enhance your dollhouse collection with this Metal Black Kitchenware 10pc. Added to your other dollhouse miniatures, it is a complement for a variety of styles and tastes. 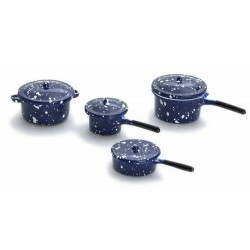 You will love this Blue Spatter Pot Set/8 as it complements your other miniature dollhouse furnishings. Now is the time to design a great new look! 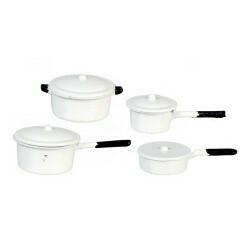 Adding this White Pot Set 8pc to your miniature collection is just what you need to make your dollhouse a home, and showcase your fabulous taste. 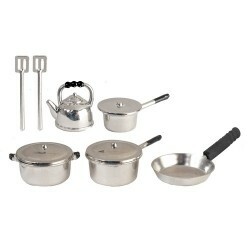 You will love this Metal Silver Kitchenware 10pc as it complements your other miniature dollhouse furnishings. Now is the time to design a great new look! 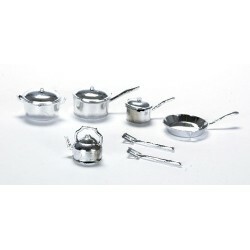 Adding this Aluminum Cookware/8pcs to your miniature collection is just what you need to make your dollhouse a home, and showcase your fabulous taste. 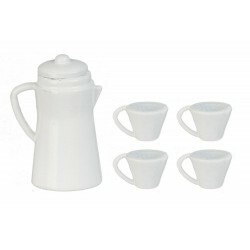 You will love this White Coffee Set Set 5pc as it complements your other miniature dollhouse furnishings. Now is the time to design a great new look! 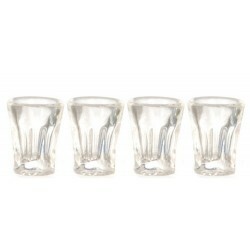 Enhance your dollhouse collection with this Bistro Glasses/set/4. Added to your other dollhouse miniatures, it is a complement for a variety of styles and tastes. 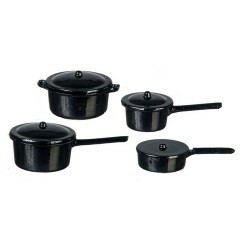 You will love this Black Pot Set 8pc as it complements your other miniature dollhouse furnishings. Now is the time to design a great new look! 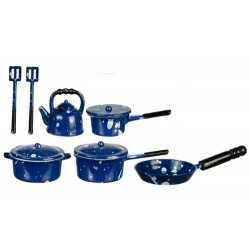 Adding this Metal Blue Spatter Kitchenware 10pc to your miniature collection is just what you need to make your dollhouse a home, and showcase your fabulous taste. 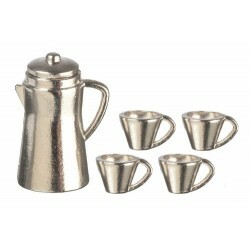 You will love this Silver Coffee Set 5pc as it complements your other miniature dollhouse furnishings. Now is the time to design a great new look! Adding this Metal Pie Pans/ Set/6 to your miniature collection is just what you need to make your dollhouse a home, and showcase your fabulous taste. 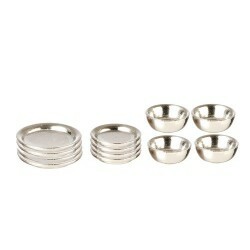 Spruce up your dollhouse with this miniature Silver Dishes Set 12pc. 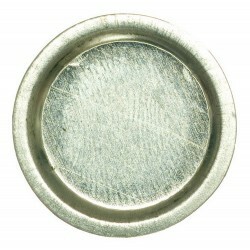 We have many miniature Miniature Cookware & Dishess for that finishing touch.